One of their initiatives came to fruition on Thursday with the revealing of a commemorative stamp by Royal Mail Heritage bearing the words Swindon 175. STEAM was chosen as the perfect venue to unveil the stamp.It features a picture of a Dean Single Locomotive from the GWR’s Achilles Class, which was built at the railway works in Swindon between 1891 and 1899. 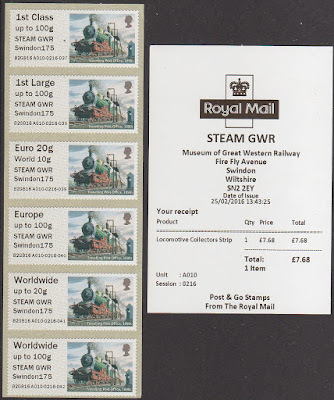 The new stamp was to be dispensed from Post and Go machine A010 which has been selling Machin head and Union Flag faststamps with the STEAM GWR inscription. From yesterday the inscription Swindon 175 was added. Unfortunately due to problems with Royal Mail's new computer system at Tallents House the Heritage Transport locomotive-only rolls were not delivered on time, and not until after lunch were the crowds (and collectors) able to but the new stamp. Swindon News shows STEAM’s Ian Surtees with Royal Mail’s Post and Go machine. A work-around solution was found for people buying when the event started. They bought Machins with the new inscription, which were then taken by the people manning the machine, to be replaced by Locomotive stamps with the right session numbers etc. 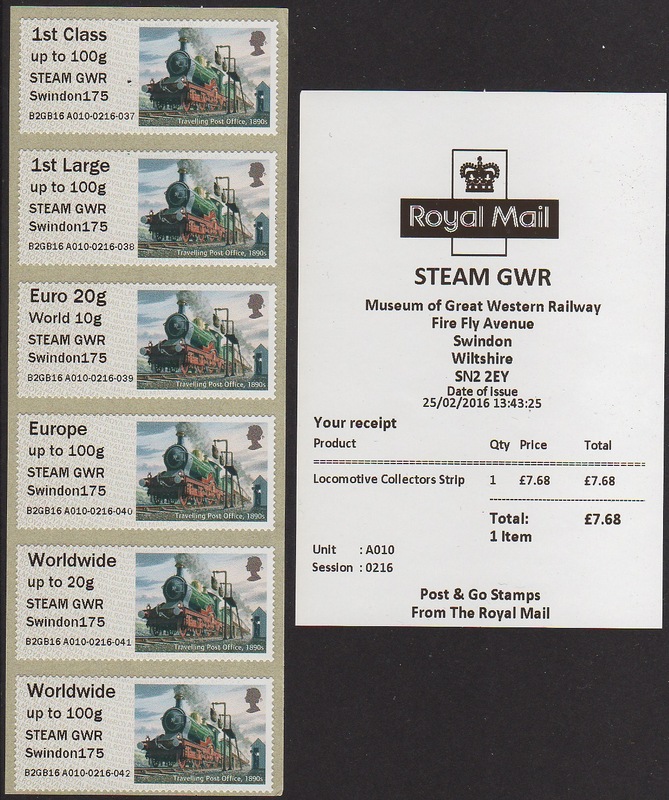 These are to be sent to the buyers through the post - would be nice if the postage was paid with Steam GWR Swindon 175 stamps, wouldn't it? Thanks to Chris, Bob, Malcolm, and Andrew for the story as it happened, and for pictures. I will be producing a limited number of Maximum Cards with the Locomotive stamps and the special postmark using Beric's card of the Didcot Railway Centre Great Western TPO Coach 814 built at Swindon.